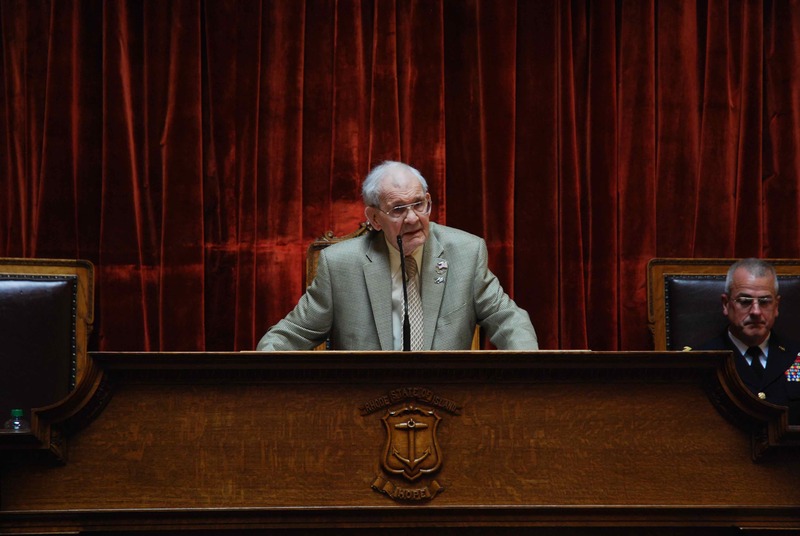 The Rhode Island House of Representatives held a ceremony honoring 2nd Lt. Robert Thorpe. On May 17, 2013, 2nd Lt. Robert Thorpe was finally given recognition at a ceremony that was held in the House of Representatives chamber in the Rhode Island State House. Family members attending included Thorpe's brother, Gill; Gill's daughter and son-in-law, Susan and Richard Waterman; Gill's grandsons, Richard and Sam Waterman; Gill's daughter Janet Thorpe; daughter Gill's cousin Neil Ganz and his wife, Caroline. Representative Raymond Gallison, the then Chairman of the House Committee on Veterans Affairs, hosted the ceremony and recognized all of the family, military and elected officials in attendance. Governor Lincoln B. Chafee acknowledged Robert Thorpe's sacrifice by saying "despite brutal treatment he did not cower, he went to his death bravely and defiantly." Brigadier General Petrarca - RI Army National Guard spoke in tribute to Thorpe and the members of the American World War II armed forces. HOUSE RESOLUTION - HONORING 2ND LT. ROBERT E. THORPE FOR HIS HEROISM DURING WWII Introduced By: Representatives Martin, Gallison, Abney, Newberry, and Fox. Date Introduced: May 14, 2013. Referred To: House read and passed May 13, 2013. RESOLVED, That the Secretary of State be and hereby is authorized and directed to transmit duly certified copies of this resolution to The Honorable Lincoln Chafee, the Rhode Island Congressional Delegation, Maj. Gen. Kelly K. McKeague, Commander of the Joint/POW/MIA Accounting Command, the Providence Regional Office of the U.S. Department of Veterans Affairs, and Nancy and Gill Thorpe. Captain Lew Lockhart speaks on behalf of his friend, 2nd Lt. Robert Thorpe at the Rhode Island House of Representatives ceremony. Captain Lockhart was introduced and escorted to the dais. The audience was very moved that this 92 year old veteran, who had travelled from Tennessee, was able to make express his memories of Thorpe with a speech that was short and to the point. "I think it is a great privilege for me to be here in order to honor Bob. I flew with Bob on many missions before the one where he went down. Although I was on a flight that same day, Bob was on another flight. We didn't know what happened to him when he didn't return to the base the next day for the debriefing. Bob's closest friend and tent mate, Fred Tobi and I were on a search mission for him the next day. Of course we found no remains. It was only many, many years later that we found out what happened to him through the efforts of Ken Dooley. I think it is only proper that Bob gets the recognition today that he deserves as a true American hero." Author Ken Dooley spoke about his attempts over many years of researching what actually happened to Thorpe, the post-war trial of the five Japanese soldiers who were tried and found guilty of Thorpe's murder. "That generation is tough as nails, the whole group of them. They didn't wait to get drafted. They are truly great Americans. People don't need to forget what they did. The people of Rhode Island sure didn't." Alan Fung, the mayor from the Thorpe hometown of Cranston, read a citation honoring him. The House reading clerk, Francis McCabe then read a resolution honoring Captain Lockhart. RESOLVED, That the Secretary of State be and hereby is authorized and directed to transmit duly certified copies of this resolution to Governor Lincoln Chafee and Captain Lewis Lockhart. John Gallo - Chief Master Sgt - President of the HVAC - and members were recognized. Chaplain Ron Martin Minnich of the RI Army National Guard gave the closing blessing and Army Sgt Clifford Soares played Taps to end the ceremony. After the formal ceremony, Capitol TV announcer, Dave Barber interviewed Rep. Martin, Ken Dooley, Lew Lockhart and Gil Thorpe. During the interviews, Barber quoted General Patton as saying - "Live for something rather than die for nothing." As he walked out of the House chamber, Martin, who had never heard that quote before started to think - should it really be "Die for something rather than live for nothing." 2nd Lt. Robert did not die for nothing.